We made gingerbread cookies today! Mostly because we were bored. We followed a recipe from a book my future brother- and sister-in-law got me for Christmas. They turned out pretty well! The only thing we noticed after the first batch came out, was that they were incredibly hard! We both prefer cookies that are on the softer side (call us old haha), so we shortened the time by one or two minutes so they came out soft but were still cooked. In a large bowl, combine the flour, nutmeg, cinnamon, baking soda, salt, cloves and ginger. Set aside. Using your electric mixer (or a separate large bowl), cream the butter and brown sugar together on low speed until combined. Next add the eggs and molasses until combined and smooth. Slowly add the dry ingredients until the cookie dough is formed. When it’s all combined, wrap the dough in plastic wrap and cool in the fridge for up to 1 hour or until firm. After an hour, let the dough sit for about 15 minutes so you can work with it. Take a 1/2 cup of dough at a time, roll it out until it’s about 1/4-to-1/8 inch thick, then cut out what ever shapes. Place the cut outs on cookie sheets lined with parchment paper and bake for 8-10 minutes. Like I said earlier, we baked them for 10 minutes, but they were too hard for our taste. So we ended up baking them for 8 minutes or so, and they turned out perfect! 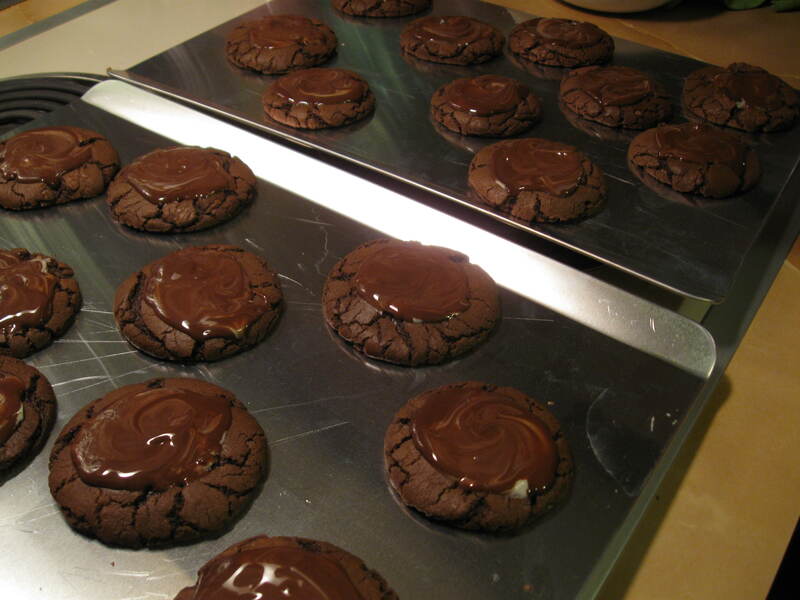 Transfer them to a cooling rack and let them cool completely before you decorate them. The recipe said it would make 18-24 cookies, but we easily got about 30 cookies out of the dough. We weren’t making big shapes though and we also made them a little thicker than what was probably called for…so do what you want! That’s half the fun. This entry was posted in Desserts, Food and tagged AARR! !, cookies, gingerbread, gingerbread cookies, Holidays, yum!!!! on December 28, 2010 by Aparna B.. The holiday season brings out the Holly Homemaker in me. Well OK, not really, but I seem more inclined to bake during the holidays. REB and I have wanted cookies for a few nights now. I realized I had everything in my pantry to make cookies, so why not? This is based on the typical chocolate chip recipe, but has a few little twists. The end result was perfection. In a medium bowl, combine the flour, baking soda and salt and set aside. In a large bowl, or in your stand mixer, cream the granulated sugar, brown sugar and butter on medium speed until smooth and creamy. Reduce the speed to low and add the eggs, one at a time, the vanilla and espresso. Beat until smooth. Slowly add in the dry mixture until the entire batter is smooth and combined. Turn the speed up to medium and add the walnuts. 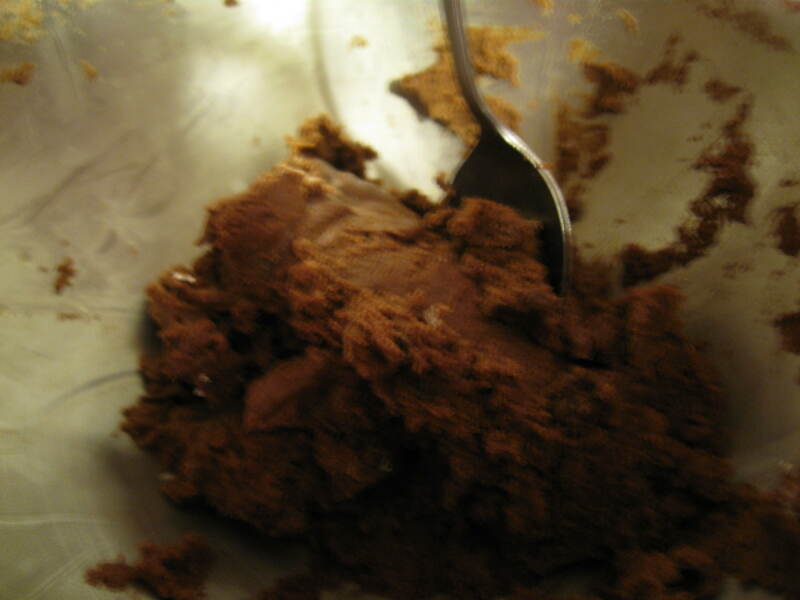 Then turn off the mixer and fold in the chocolate chips and mint chips until combined. Let the batter chill in the fridge, uncovered, for 15-20 minutes. 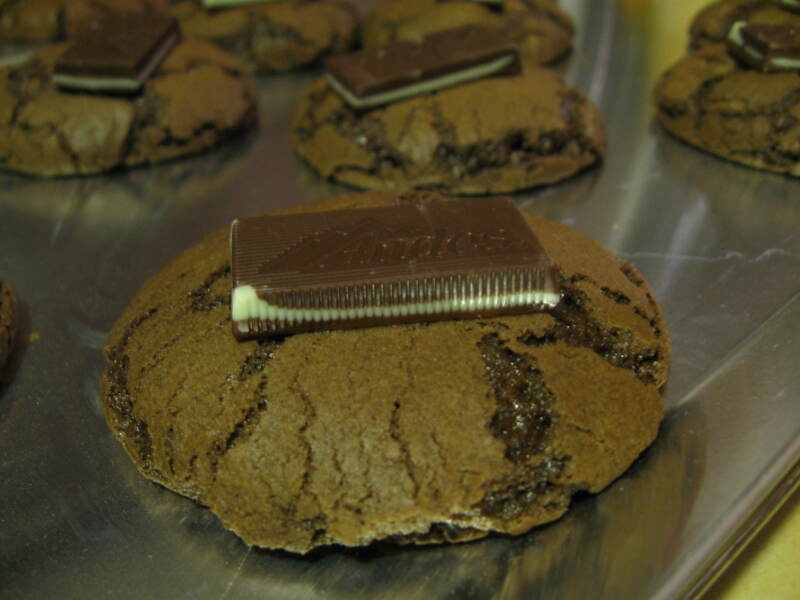 Scoop a tablespoon of batter onto an ungreased cookie sheet and bake for 9-to-11 minutes or until golden brown. This entry was posted in Desserts, Food and tagged baking, chocolate chips, cookies, desserts, Holidays, mint chip cookies, mint chips, walnuts on December 22, 2010 by Aparna B.. I love to bake. I don’t do it that often. I should remedy that. My sister and I are on a baking extravaganza that will complete over the course of three days. Yes, three. Why give presents when you can give baked goodies to your closest family and friends…? Exactly, that’s what I thought. 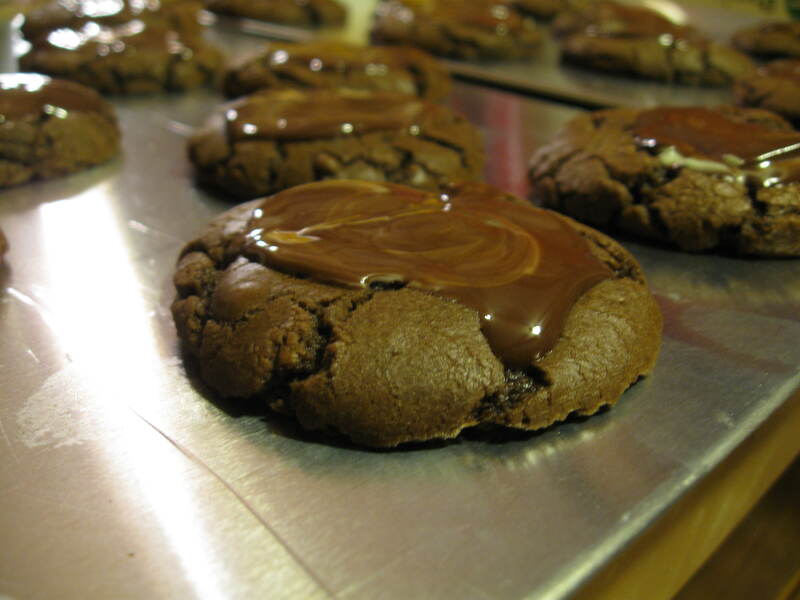 I’ve talked about my and V’s famous chocolate mint cookies before, and I’ve posted many photos of their perfection on my Flickr, but now I shall share the recipe with all you out there. You should feel special. No, really, you should. DO IT. 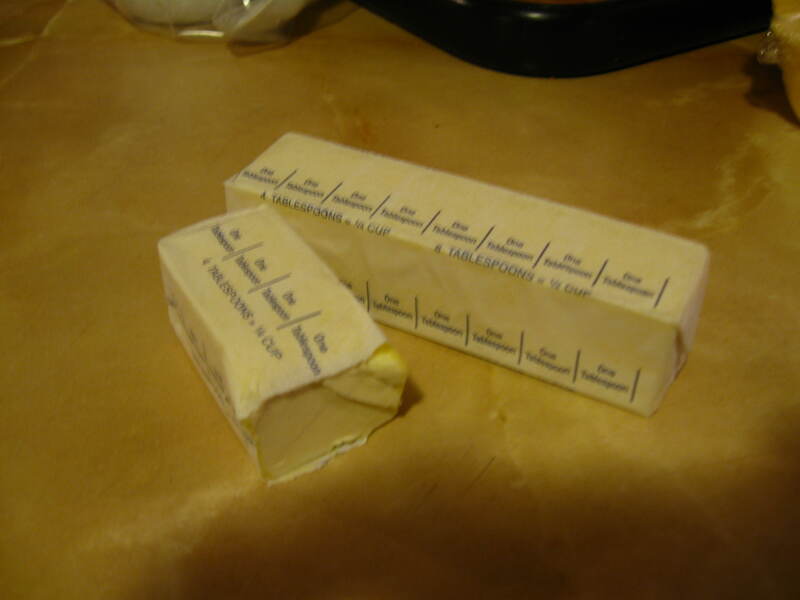 Start with the butter. Yeah, I know it’s a lot but you can’t skimp when it comes to these cookies. Besides, it’s the holidays. Isn’t the gym for the resolutioners any way…? 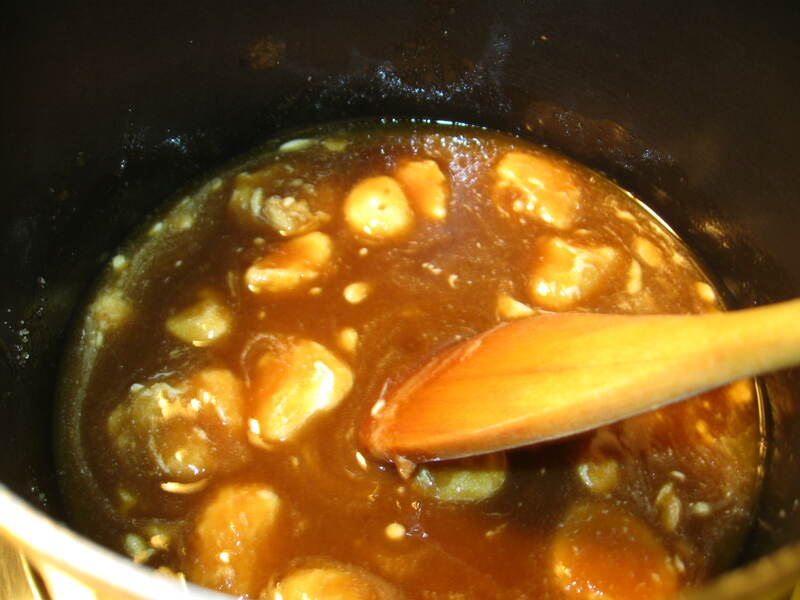 In a large saucepan, cook the butter, brown sugar and water together until melted. Add in the chocolate chips and stir to partially melt. Remove from heat and continue stirring to completely melt the chocolate. Pour this mixture into your mixer bowl, or into a larger bowl. 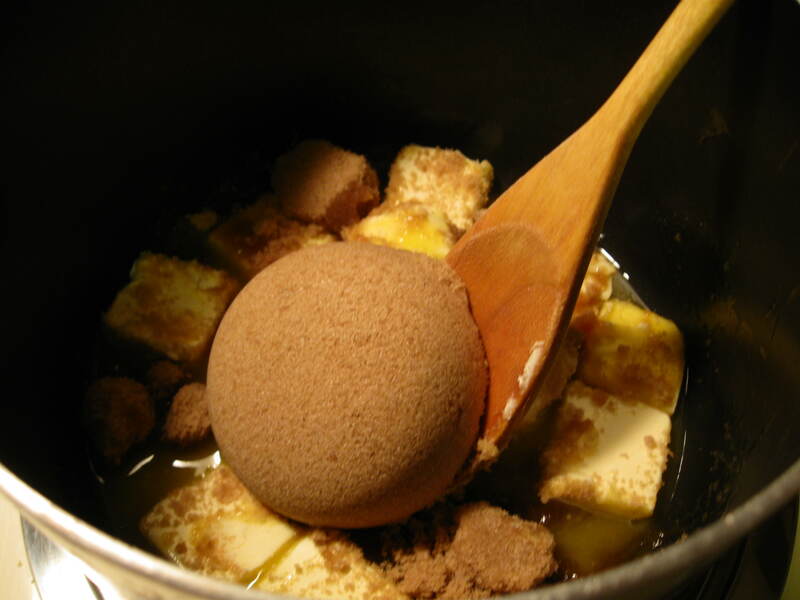 Beat the eggs at high speed, one at a time, into your chocolate mixture and mix until blended. Reduce the speed to low and add in your dry ingredients and mix until blended and a dough forms. Chill the cookie dough, uncovered, in your fridge for up to 1 hour. 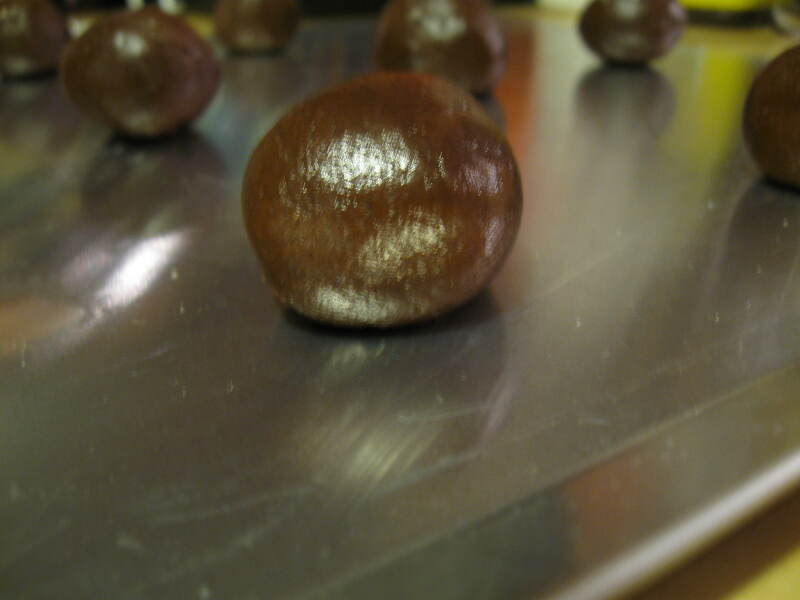 When the dough has set and hardened (I pulled the bowl out after about 45 minutes), take a little bit, roll into a ball and place on an ungreased cookie sheet about 2 inches apart. Don’t they look magical? I thought so too. Bake at 350ºF for 8-10 minutes. You’ll know they’re done because the cookies will spread and be kind of cracked on top. 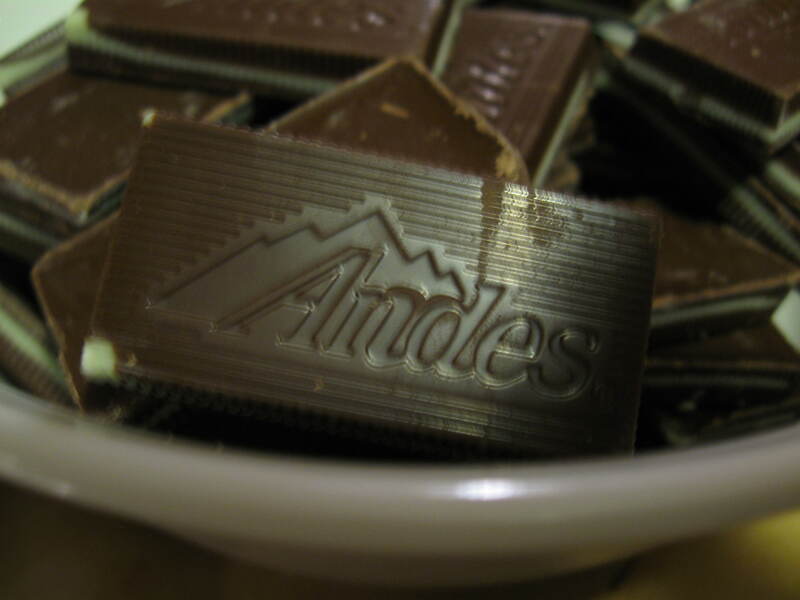 While the cookies bake away, unwrap the Andes mints. Try to contain yourself and not eat them as you unwrap. But that’s why you buy three packages…mwahahaha. When the cookies come out, this is when the magic really happens. Immediately after the cookies come out, place one mint on top of each cookie and let them melt into ooey-gooey-melty-amazingness (yes, thats is a word). Then be patient and let them melt for up to 5 minutes. Once they’re kind of melted, you can use the back of a spoon to spread the chocolate all over. Patience is a virtue, isn’t it? This is what you end up, and it’s amazing and wonderful and delicious. Go ahead. Tell V and me that we’re awesome bakers. Actually, thank her sister-in-law. I think it was her who gave us this recipe. She’s basically my hero. Srsly. My hero. This is a staple made every Christmas now. Even if I can’t make it with V, they get made. And they’re delicious. Happy Holidays! This entry was posted in Desserts, Food, Holiday Food and tagged baking, chocolate mint cookies, Christmas, cookies on December 22, 2009 by Aparna B..